The Library Service at St Charles supports teaching and learning within the College, through the provision of relevant teaching resources and the development of study and information skills. 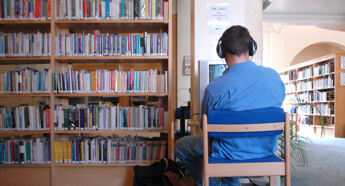 The Library Service aims to equip students with the knowledge and skills that help them to become independent learners. We offer a full enquiry service and are happy to help both staff and students with locating resources either online or in the library itself. We are open from Monday to Friday 8.30am until 5pm, The library closes every day from 10.50am until 11.10am so that students can attend registration.